Bowls that retain the bark of the tree as a rim decoration are always popular, both as a turning project and as a purchasable item by those looking for unusual gifts. Such bowls are generally referred to as bark-rimmed or live-edge bowls unless the bark is removed, at which time they become natural-edged bowls. The urge to retain the bark of a log or the spiky surface of a burl is pretty well irresistible if it’s free of defects. A bark or natural-edge rim can point up jagged as a mountain range, or it can be flat with an edge to rival a fjord coastline. 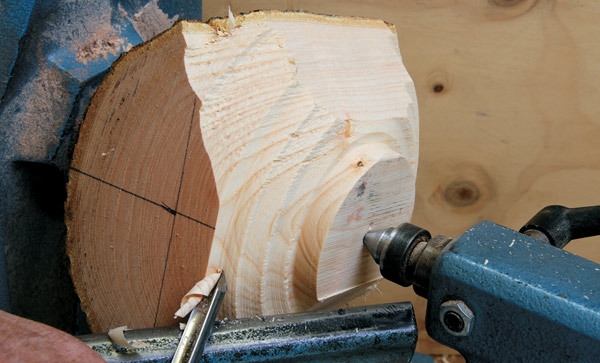 Both those require particularly spectacular material, but here I’ll show you how to create a saddle shaped bowl from an ordinary round log with a bark rim that looks oval from above. This open bowl with its out-flowing profile will have its top two points on one horizontal plane, and the lower points of the rim on another. Because this is an out-flowing form the blanks can be wedge-shaped. 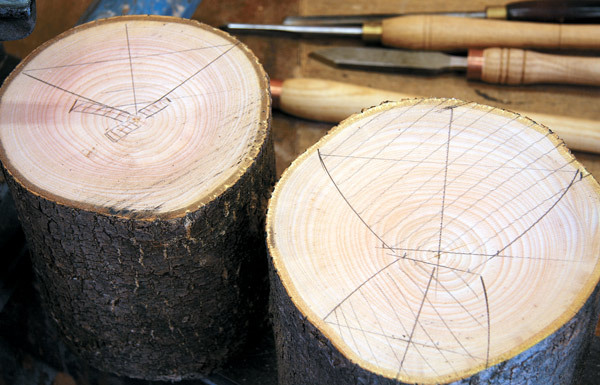 This means that from a perfectly round log with the pith in the centre you can cut three or four bark-rimmed bowls where you’d normally extract only two conventional bowls. For the best chance of retaining the bark, the tree should be felled in the winter when the sap isn’t rising. Some logs will almost always dry satisfactorily whilst retaining the bark, like Tasmanian horizontal scrub, claret ash, and some redgum. With other species it seems to be pot-luck. 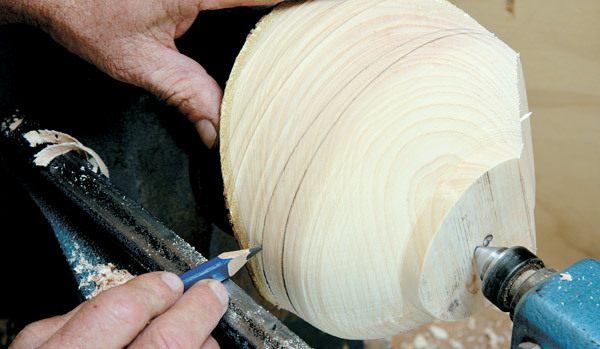 For this sort of bowl, look for a section of log that is knot free with fairly straight and even grain. Such material will give you concentric rings into the base on the inside, as well as a visually balanced rim. You need to have the grain aligned across the blank as is usual for bowls. Hollowing into endgrain is not a good idea: first, it’s hard work; but then, even though that does provide a bark rim, the alignment of the wood within the bowl makes for a weak structure. Endgrain bowls are likely to split or distort at the pith and are more likely to break than a cross-grained bowl when dropped. 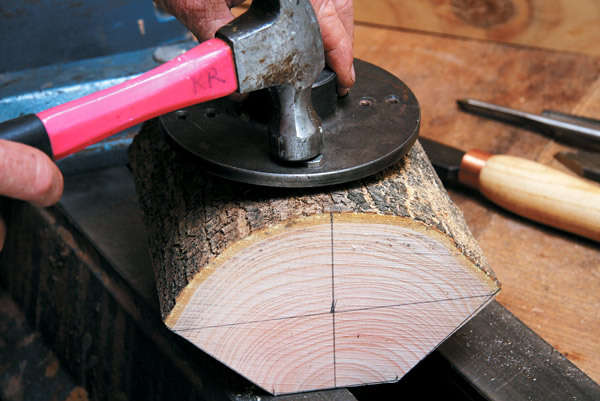 From a log, dock a length equal to the diameter, and stand this on end so you can layout the blanks on the endgrain. Marked splits like those to the left in (photo 2) are easier to avoid as you layout the blanks. Then (photo 1) position a ruler so the bark forms a symmetrical arch over a line the length of the log (here 180mm) and mark centre. Each end of the line must reach the bark. At centre draw a line at right angles to the first line, then another parallel to the first that will define the base of the bowl. Then sketch in the sides. Typically these are likely to be straight lines as on the left log in (photo 2) to make bandsawing easier. On the right log the blanks are hatched, the small one in front yielding two smaller bowls. The log on the right split from the pith almost instantly, but I decided that would vanish in the roughing, or at worse reduce the height of the bowl. 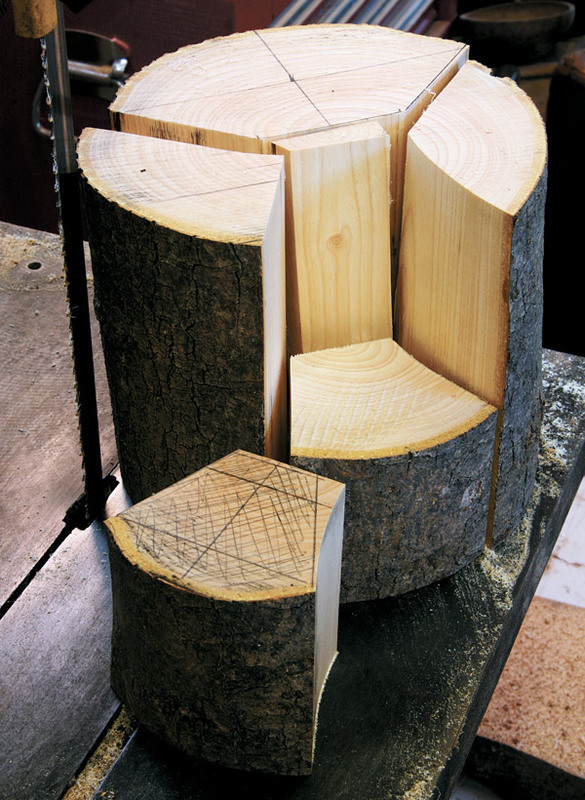 Keeping the log on end, use a bandsaw to make a series of cuts, slicing the log like a cake (photo 3). 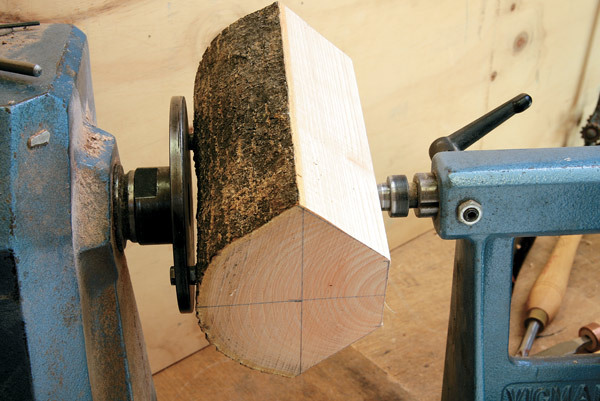 Logs too tall for your bandsaw have to be fixed bark up in some sort of sawhorse then cut using a hand or chainsaw. Or if the grain is straight you might be able to cleave the log into suitable billets: something I could have done with this claret ash. Natural edge bowls frequently look off balance when their rims are tilted at an angle, and they typically look good from one direction only which doesn’t appeal to me at all. That visual problem stems from an inability to adjust the blank once it’s on the lathe when it’s fixed in a traditional manner to a screw chuck or by screws to a faceplate. A pin chuck will hold a blank securely, but it’s near impossible to drill the required hole at precisely the right angle for a balanced form. My aim with this project, as with life, is to keep my options open for as long as possible. Fixing the bowl between centres is the best way to go, as you are then able to adjust the blank as work proceeds. Small blanks can be driven by the standard 4-spur drive, although 2-spur drive is better as that can be located in a v-cut aligned along the top of the bowl. Better still is the big 2-spur drive I’ve used for a couple of decades. You make this yourself by inserting a couple of bolts in the faceplate that comes with the lathe. Once secured with nuts, the ends are sharpened so they can be hammered through the bark into solid wood, or located in predrilled holes. Be sure to align the bolts or holes along the top of the blank in line with your central layout line. With the blank fixed between centres on the lathe this becomes the axis around which the blank is pivoted to bring the lowest points of the rim into the same horizontal plane (photo 4). The first line you drew on the endgrain from bark to bark now needs to be parallel to the faceplate. If the low points are not in the same plane, as is usually the case, this will be easy to rectify after a few roughing cuts. 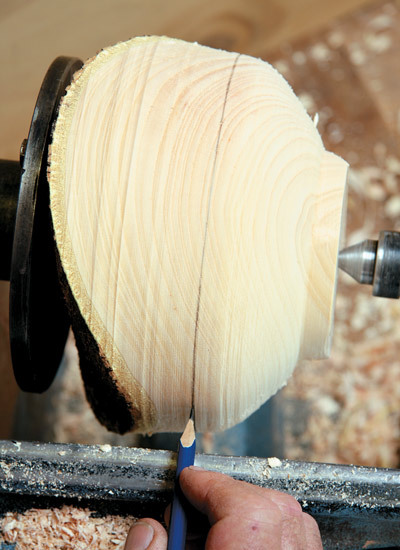 As is usual when you begin turning the outside of a bowl, aim to get the bulk reduced as quickly as possible by roughing the lower half of the profile (photo 5) . 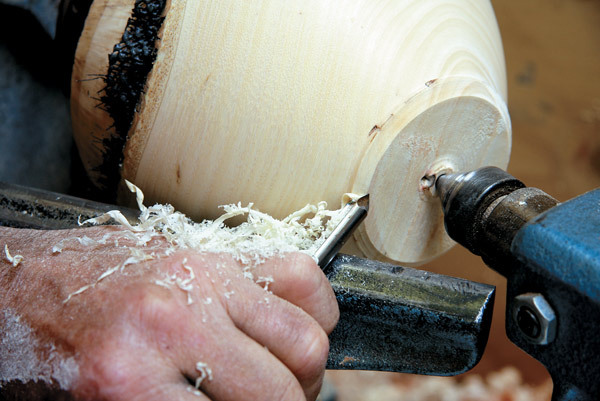 It’s also good practice to establish a foot as soon as possible so that if the drive fails you can flip the bowl and grip the foot in a chuck so you can continue the roughing process. Here, as usual, I use a spindle gouge with a fingernail grind to rough the profile, but you can also use a more expensive bowl gouge. Note that I cut only as far as the bark because that’s likely to splinter away if you cut from this direction. Work the bark section from the upper face as in (photo 6), so that fibres below support the fibres you’re cutting. These are roughing cuts where the bevel doesn’t rub the wood, hence the ridged but cleanly cut surface. 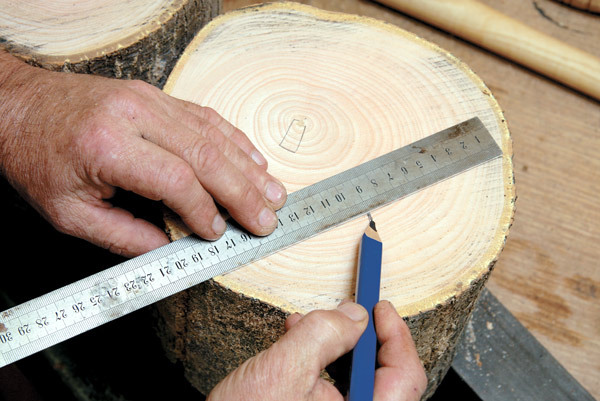 When you have the bark section trued, it’s time to assess the alignment of the blank. 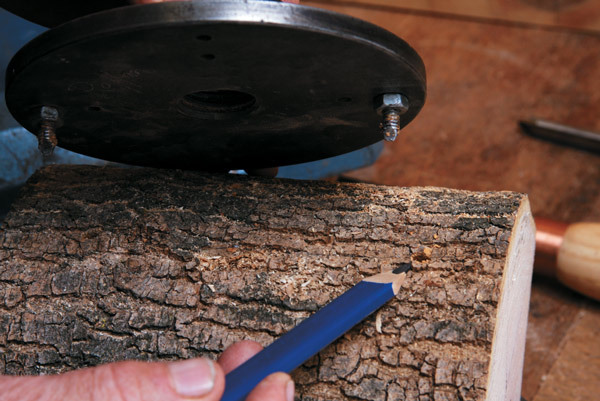 Hold a pencil at the base of the bark on the lower of the two sides and rotate the wood by hand to scribe a line around to the other side (photo 7), which in this case is about 15mm higher. Typically you need to move the tailcentre about one third to half the gap to bring the two low points into the same plane. Every time you relocate the tail centre you scribe another line between the two low points to check (photo 8). Aim to have the both low points touch the line in the same manner. 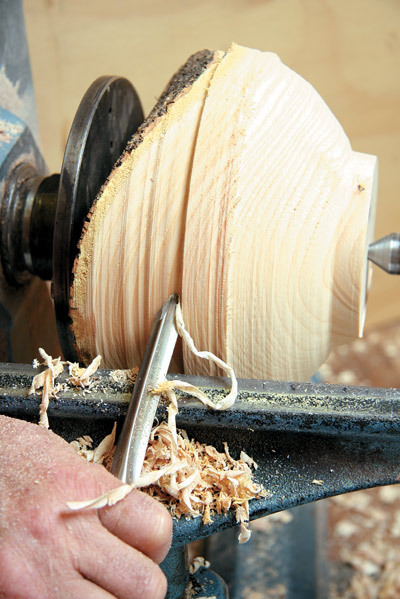 If you are using a small spur drive that allows the blank to pivot in more than one plane, you need to check the upper points of the rim using the same technique, except that you’ll not be scribing a line as there’s no wood between the two points on that plane. Note how the tail centre has been repositioned. With the alignment completed finish the profile: shear cut from the base up to the bark, then in from the rim for the upper section. For these cuts I use a 3/8” deep-fluted bowl gouge with a steep right wing that enables me to start cutting just above the foot (photo 9). I use the same gouge to cut in from the rim, then find it easiest to fare the two cuts shear scraping with a skewed scraper (photo 10). 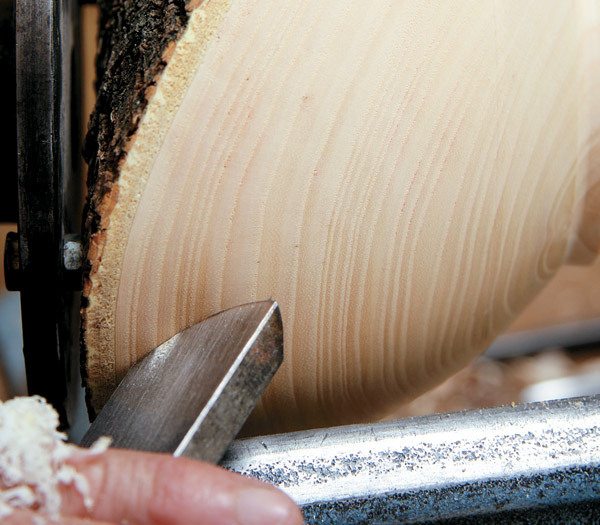 Shear scraping generally produces the best surface working the bark sections (where there is more space than wood). By taking a series of short back and forth shear scraping cuts that remove only dust or diaphanous ribbons you can minimise tool pressure against the wood as it passes more easily than when using a gouge. 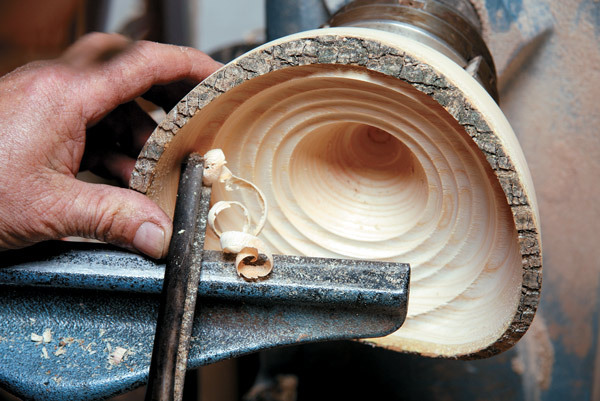 When it comes to sanding, the most accurate way to sand the wings of the bowl is power sanding with the lathe switched off. Rotate the wings of the bowl past the sander, or lock the spindle so you can use both hands to take the sander to the wood. The best tool for this is an angle drill. 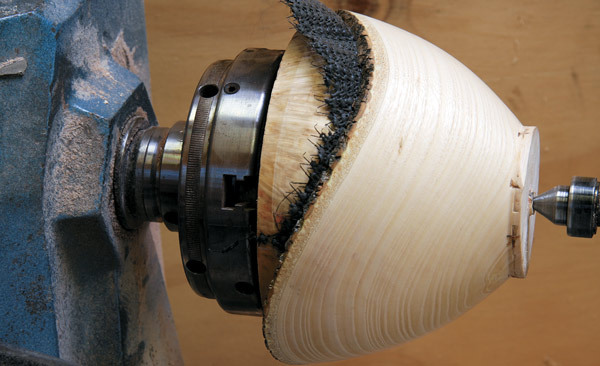 Before you remove the bowl for hollowing, ensure that you’ve trued and undercut the rim of the foot so that it fits neatly against the chuck jaws. Retain the conical tail centre hole for when you come to finish the foot. Drill a depth hole so you know how deep to go, then open that up so you can see the bottom and the point to which all subsequent cuts will relate. Then hollow to just below the bark, aiming for an even wall thickness. Rims of uneven thickness usually look inept. Heavy sanding will thin the leading edge of each wing, so it pays to cut the wings as cleanly as possible using a gouge: you don’t want to poke a scraper against the wings as they become thinner as that’s asking for rim-destroying catches. Ensure you start the gouge on its side to prevent a run-back that will also damage a natural edge. 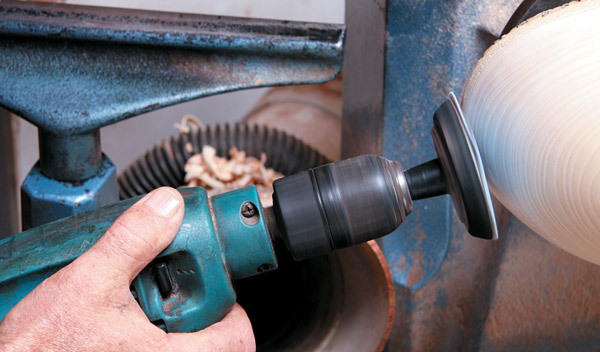 In (photo 11) you see a 1/2” nch deep-fluted bowl gouge in action. 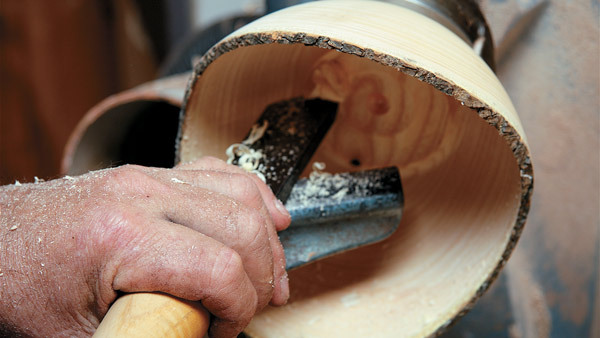 It helps to have your fingers supporting the wood to reduce vibration, and keep your hand on the rest. For the final cut for the wings I prefer the lighter 3/8” gouge I used to complete the profile. Once you have the rim an even thickness and as thin as you want it, complete the hollowing. When making the earlier roughing cuts I ensure each is slightly shorter than the last, creating a series of shoulders against which the gouge bevel can be presented for starting subsequent cuts. It makes life a lot easier. I remove most of the waste with the bowl gouge, but complete the curve into the base using a large scraper with a slight radius (photo 12). As on the profile, the wings are best power sanded to preserve the even wall thickness, (photo 13). The best tool for the remounting a bowl so you can complete the base is a vacuum chuck that I don’t have because mostly I’ve worked burl with holes in. I’ve always used jam chucks, and this is typical. This chuck is a roughed out bowl mounted over Vicmarc Step Jaws (photo 14). 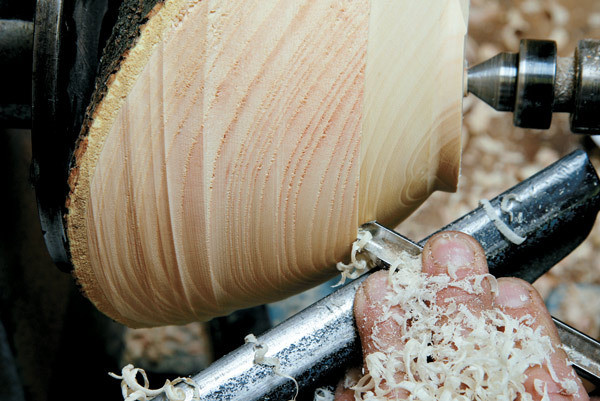 The bowl/chuck is trued to a smooth round that fits into the bowl to be finished. To protect the latter, I insert non-slip matting or cloth or kitchen paper between the two, then bring up the tail centre to its original position to centre the job. Now it’s simply a matter of shaping the foot as you want and finishing the base. ...and usually a shear scraper for a finer finish off the tool prior to sanding (photo 16). The remaining nub can be chiselled away and sanded away from the lathe, but I find that the bowl is usually on the chuck securely enough that I can finish the base using the small gouge on the lathe (photo 17)—making sure that my hand is around the bowl at all times, just in case. 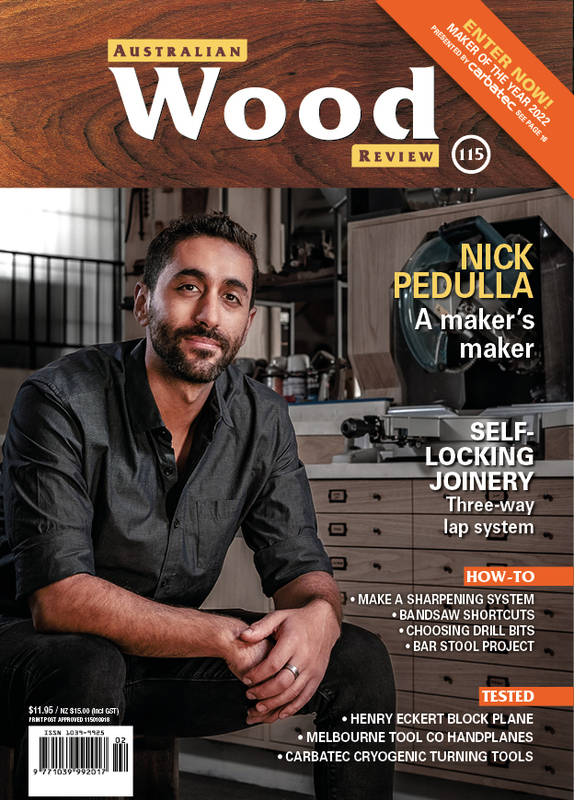 First published in Australian Wood Review magazine, issue 61.